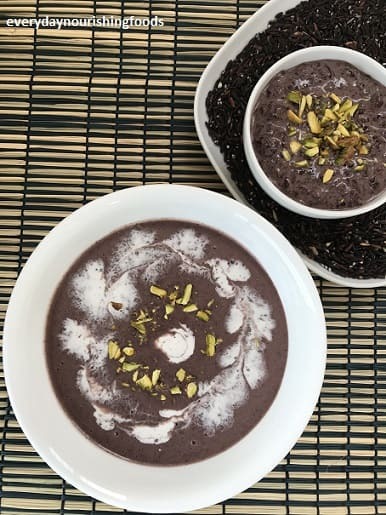 Black rice pudding – a simple and vegan kheer or pudding recipe with black rice, coconut sugar, and coconut milk. Rice is our staple food and we eat quite a lot of it. I always try to include different types of rice for their nutritional benefits. Black rice often called as forbidden rice, is an ancient grain which has all benefits as regular rice and is also rich in antioxidants. Black rice is rich in iron and known to be good for Kidneys. We consume hand pounded rice every day, as completely polished rice doesn’t contain all vitamins and minerals. This is a good read if you want to know all about rice and its benefits. Generally, we use red rice or brown rice for dosas, hand pounded rice for making rice flour. We use rice flour also quite often in our day to day cooking. Rice flour is generally used in many breakfast recipes. I have posted the recipe for sarvapindi here. We also make upma, instant dosas with rice flour. Till now, I have made the only kheer with black rice. I should try more recipes with this. Black rice and mango combination will be very good and I try to make this kheer in mango season. If I add mango to the kheer, I will skip the sugar completely. Black rice is naturally sweet in taste and mango complements it. Another kheer recipe with quinoa can be found here. Please check this link for all sweet recipes on this blog. This recipe has coconut milk, you can use regular milk as well to make this recipe. I made a smoothie out of this kheer by blending it with coconut milk. This will be a good breakfast option and can be easily carried to the office. Instead of coconut sugar, dates paste or jaggery or palm sugar can also be used to make the payasam. Healthy and tasty kheer or payasam recipe with black rice, coconut milk, and coconut sugar. Drain the water from soaked rice and wash it thoroughly. Add 1 cup water to washed rice and cook like regular rice. It took around 15 minutes for me on the stove top. Rice can be cooked in the pressure cooker as well. Mash the cooked rice with a potato masher. Add cardamom powder, coconut sugar, coconut milk and mix everything well. This kheer can be served hot or cold. If you wish to serve hot, boil it for 5 minutes and it will be ready to serve. Else, refrigerate and serve the kheer when it is cooled enough. You can use nutmeg or vanilla beans as well for flavoring the kheer.